The Question-and-Answer interview was one of Andy Warhol's favorite communication vehicles, so much so that he named his own magazine after the form. 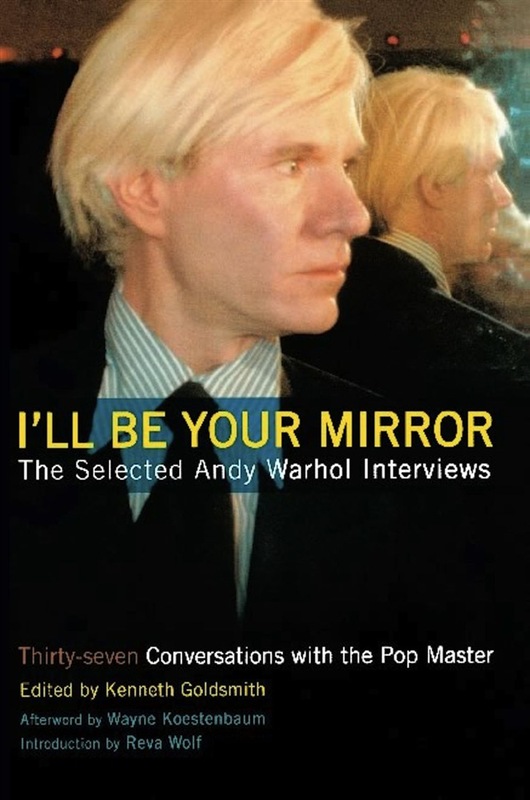 Yet, never before has anyone published a collection of interviews that Warhol himself gave. I'll Be Your Mirror contains more then thirty conversations revealing this unique and important artist. Each piece presents a different facet of the Sphinx-like Warhol's ever-evolving personality. Writer Kenneth Goldsmith provides context and provenance for each selection. Beginning in 1962 with a notorious interview in which Warhol literally begs the interviewer to put words into his mouth, the book covers Warhol's most important artistic period during the '60s. As Warhol shifts to filmmaking in the '70s, this collection explores his emergence as socialite, scene-maker, and trendsetter; his influential Interview magazine; and the Studio 54 scene. In the 80s, his support of young artists like Jean-Michel Basquait, his perspective on art history and the growing relationship to technology in his work are shown. Finally, his return to religious imagery and spirituality are available in an interview conducted just months before his death. Including photographs and previous unpublished interviews, this collage of Warhol showcases the artist's ability to manipulate, captivate, and enrich American culture. Acquista I'll Be Your Mirror in Epub: dopo aver letto l’ebook I'll Be Your Mirror di Goldsmith Kenneth, Wayne Kostenbaum ti invitiamo a lasciarci una Recensione qui sotto: sarà utile agli utenti che non abbiano ancora letto questo libro e che vogliano avere delle opinioni altrui. L’opinione su di un libro è molto soggettiva e per questo leggere eventuali recensioni negative non ci dovrà frenare dall’acquisto, anzi dovrà spingerci ad acquistare il libro in fretta per poter dire la nostra ed eventualmente smentire quanto commentato da altri, contribuendo ad arricchire più possibile i commenti e dare sempre più spunti di confronto al pubblico online.